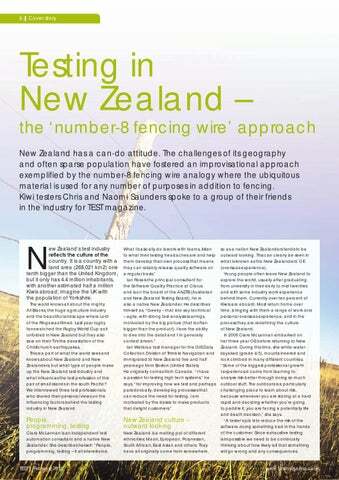 the ‘number-8 fencing wire’ approach New Zealand has a can-do attitude. The challenges of its geography and often sparse population have fostered an improvisational approach exemplified by the number-8 fencing wire analogy where the ubiquitous material is used for any number of purposes in addition to fencing. Kiwi testers Chris and naomi saunders spoke to a group of their friends in the industry for TEST magazine. ew Zealand’s test industry reflects the culture of the country. It is a country with a land area (268,021 km2) one tenth bigger than the united Kingdom, but it only has 4.4 million inhabitants, with another estimated half a million Kiwis abroad; imagine the uK with the population of Yorkshire. The world knows all about the mighty All Blacks, the huge agriculture industry and the beautiful landscape where Lord of the Rings was filmed. Last year rugby fans watched the Rugby World Cup as it unfolded in New Zealand but they also saw on their TVs the devastation of the Christchurch earthquakes. This is a part of what the world sees and knows about New Zealand and New Zealanders, but what type of people make up the New Zealand test industry and what influences the test profession of this pair of small islands in the south Pacific? We interviewed three test professionals, who shared their personal views on the influencing factors behind the testing industry in New Zealand. Clare McLennan is an independent test automation consultant and a native New Zealander. She describes herself: “People, programming, testing – it all interests me. so as a nation New Zealanders tends to be outward looking. This can clearly be seen in what is known as the New Zealanders’ OE (overseas experience). Young people often leave New Zealand to explore the world, usually after graduating from university in their early to mid twenties and with some industry work experience behind them. Currently over ten percent of Kiwis are aboard. Most return home over time, bringing with them a range of work and personal overseas experience, and in the process they are redefining the culture of New Zealand. 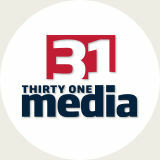 In 2005 Clare McLennan embarked on her three year OE before returning to New Zealand. During this time, she white-water kayaked (grade 4/5), mountaineered and rock climbed in many different countries. “Some of the biggest professional growth I experienced came from learning to analyse risk better through doing so much outdoor stuff. The outdoors is a particularly challenging place to learn about risk, because whenever you are staring at a hard rapid and deciding whether you’re going to paddle it, you are facing a potentially life and death decision,” she says. “A tester’s job is to reduce the risk of the software doing something bad in the hands of the customer. Since exhaustive testing is impossible we need to be continually thinking about how likely is it that something will go wrong and any consequences.